Happy Valentine’s Day! I just about made it. RL isn’t the most fun right now, but it’s a year since Ghosts came out and I wanted to share some Jack and Gareth with you all. So here’s a bit that may or may not make it into Swings & Roundabouts, Jack and Gareth’s fourth book. It hints at one of the events in Swings, so if you don’t want to know what Jack and Gareth may be up against… don’t look under the picture! Nico bided his time. He kept Daniel company while Daniel experimented with shortbread flavours. He tasted every mix and gave his opinion without a single bit of snark until Daniel settled on vanilla, cinnamon and cappucino. 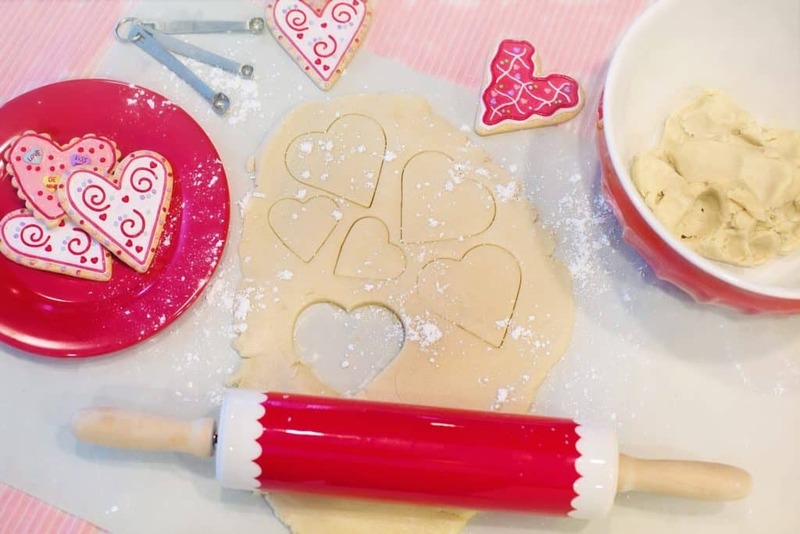 Nico watched him mix dough and cut out shapes, kept a close eye on the timer while they baked, and finally helped Daniel wrap the finished shortbread hearts in pink and white tissue paper. He listened to Daniel worry about whether or not Jess would like what he’d made for her, never mind that he thought the whole exercise completely pointless. Presents he understood. Shortbread made sense. Why it needed to be accurately and perfectly heart-shaped though….? Still, it was something that mattered to Daniel and Nico, who’d been playing with an idea of his own over the last few days, knew that Daniel wouldn’t be able to listen unless he’d got his Valentine’s Day gift for Jess just as he wanted it. Now Jess had proudly showed off the pink box of perfect almond shortbread hearts to all her friends at school. She’d declared all three flavours to be awesome and Daniel a kitchen wizard. And Daniel, who sported a deep red silk rosebud on his collar, hadn’t stopped grinning all day. He didn’t go into how much the raised voices and Jack walking out had bothered him. He didn’t have to. They’d both lain awake all that night, had listened to Gareth pace downstairs and waited for Jack to come back. And while Jack and Gareth had talked the next day, while they’d apologised and returned to their routine, things weren’t anywhere near back to the way they’d been. Daniel didn’t reply. He stared out over the courtyard, lips moving soundlessly. Nico recognised the look of Daniel mentally reviewing the contents of the larder and didn’t interrupt. Rachel’s deli was full of heart shaped things from appetisers to cheese and biscuits, and from desserts to cake. Daniel spent an age looking at all the items on offer. He even had a whispered conversation with Rachel all while Nico kept Jack busy finding wine. He and Daniel were allowed a glass of wine with dinner since it was Valentine’s Day, and Jack – after calling out a question to Rachel – finally picked a bottle of pink champagne for them all to share. Nico preferred Jack’s favourite red wine. Maybe because it had mountains on the label and had come all the way from New Zealand. Jack didn’t need a lot of prompting to add a bottle to their basket. Getting Jack to go upstairs and pack rather than join them in the kitchen was a lot trickier. Jack was suspicious and Nico always found it easier to hide things from Gareth. Jack knew and saw far too much and he was never shy to ask. “Don’t look like that,” Nico implored. “We just want to cheer you up. You’ve both not been the same and… and it bothers us?” His voice wobbled a bit at the end as he admitted that and he hated it. Fortunately, Jack knew what he was talking about. He didn’t ask anything else. He just wrapped Nico in a hug. That wasn’t news. Gareth said it a lot. Most days Nico believed it. Then the door had slammed behind Jack and the roar of his bike had sounded like the end of something good. Daniel’s punch didn’t hurt. But his glare did. “What do we think this is, then?” Jack pointed to what looked like a bite-sized croissant, complete with icing sugar dusting. Daniel was right, and they all ate the final pieces of their starter with a mix of delight and revulsion. They leaned over the second large platter Daniel had set out. It held pieces of cheese, prawns on skewers, tiny burgers in buns, chips, and even a miniature steak pie. They looked totally realistic. And all were supposedly dessert. “Really reminds me of that stuff you’re doing at work,” Gareth told Jack, only for Jack to look blankly back at him. “If you see cake and it looks like Black Forest Gateau you don’t expect to taste pickled beetroot.” Daniel was having fun. So did Gareth, who surrounded his heart-shaped chicken casserole with carrot triangles, potato hearts and mushroom squares. “Did you break the heart-shaped cutter?” he asked as they cleared away the dishes in preparation for trying the sweets. “I know,” Nico whispered fiercely. “Most days, I know that.” He breathed in Gareth’s spicy cologne, as familiar to him as the citrus scent that Jack used, and let it comfort him. Went back to believing that love came in all shapes and sizes and that family came first. And he wasn’t at all surprised when a champagne cork popped and Daniel waved a skewer of shrimps into his face.